One thing that we absolutely loved when we arrived at Kathmandu, Nepal was the variety of food. Once you have spent weeks eating Dal Baht (Traditional Nepalese Dish) while climbing to Mount Everest Base Camp or trekking around the Annapurna Region, it is heaven to be able to come back to Kathmandu and sample all the international cuisine. Here are our choices for where to eat in Kathmandu. We loved the food in Kathmandu. We had been traveling Asia for 5 months when we arrived in Nepal and we looked forward to indulging in all types of food available in Thamel, the main tourist area of Kathmandu. 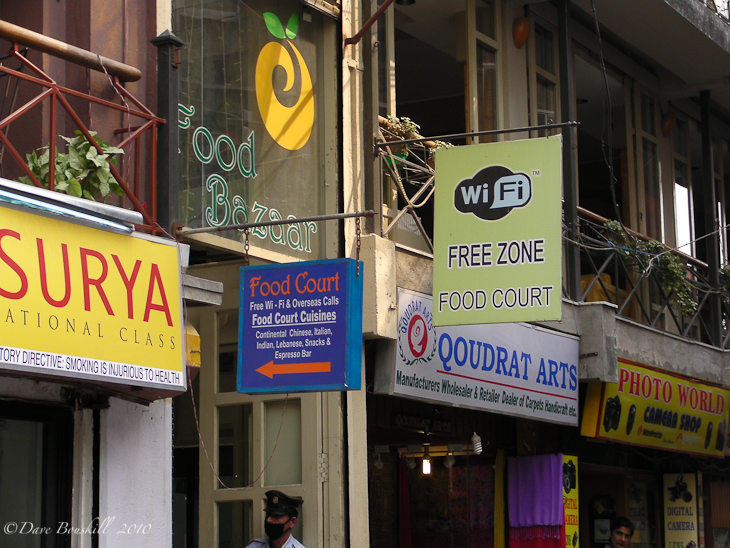 We had heard that it had the most varied menu in Asia, and we sampled it all from Pizza and Pasta to Mexican and Thai. Coming from Canada, we are used to having variety and choice in our diets. We are a multicultural country and we seem to eat food from a different nationality almost every night. While Indian Food is good, we didn't love eating it every day. Sri Lankan cuisine was a nice change, but after a month or so we had enough. Whenever we travel, we love the food at first, but no matter how much we enjoy it, our pallets tire of the same taste. Needless to say, when we saw all the different restaurants and types of food in Kathmandu, we definitely indulged. The Roadhouse Cafe was the first place that we ate in Kathmandu. 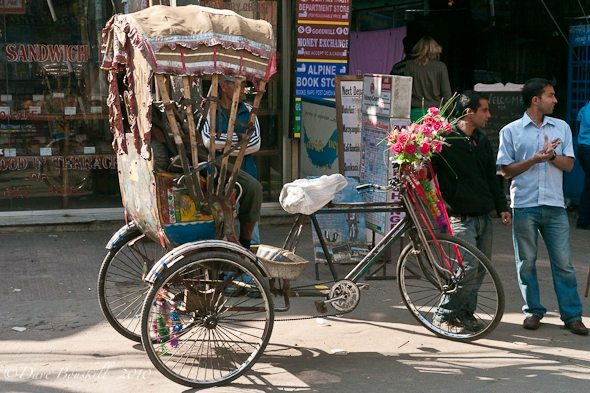 Located just down the street from the Kathmandu Guest House on JP School, it has an relaxed atmosphere. Serving Italian Illy Coffee and fresh Woodoven Pizza with olive oil and hot chilies on the side it has the best pizza in Nepal. It serves pastas and fresh bruscheta as well as delicious deserts. A quiet courtyard in the back of the restaurant gives a relaxing escape from the chaos of Kathmandu. 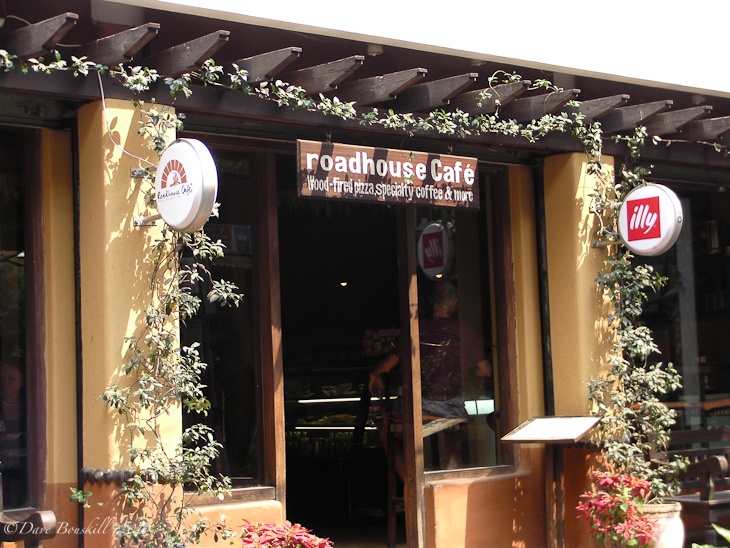 The Roadhouse Cafe is definitely tops on our list of places to eat in Kathmandu. 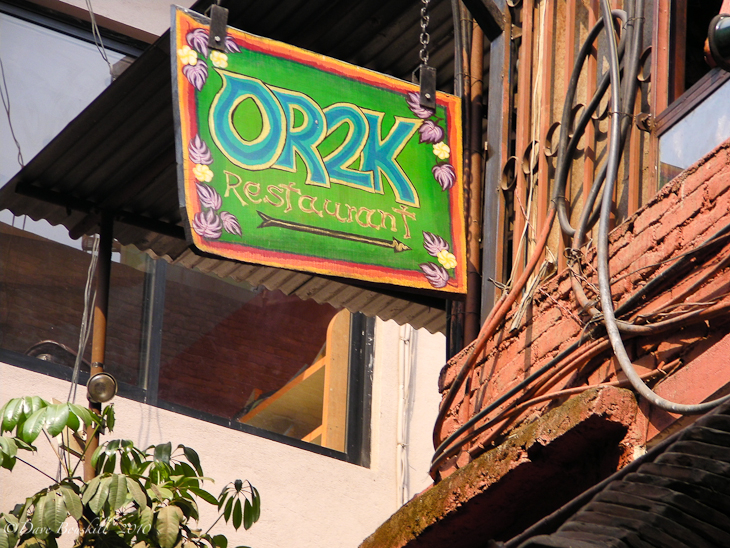 OR2K was the last place that we found to dine out in Kathmandu. Located down a side street just off Tridevi Marg, West of the Main Thamel Cowk this place is outstanding. Like many restaurants in Kathmandu, OR2K has free Wifi, but it also has atmosphere. It's Middle Eastern Cuisine is delicious and plentiful with excellent hummus and falafels. Relax on their comfortable floor cushions as you enjoy a healthy juice or fresh mint lemonade while munching on a delicious vegetarian snack. This place is packed every night and after eating there we could understand why. 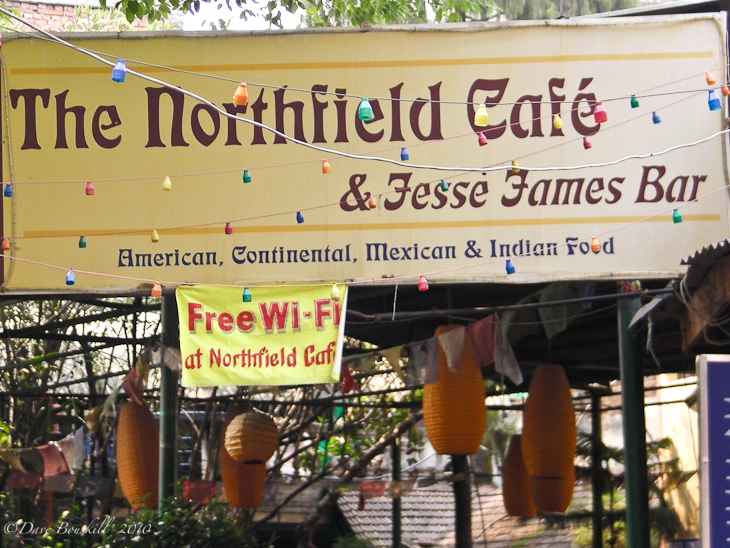 The Northfield Café's Chimichangas and enchiladas were delicious. We suggest getting the bean and grilled chicken mix when ordering your burrito or any wrap. The plates are filling and the service friendly. We enjoyed a skype conversation home while waiting for our meal using the free wifi and listened to the band playing in the background off to the side of the restaurant. A pleasant dining experience all around. It took us a while to finally make our way to New Orleans and after eating there we wondered, why did we wait so long? 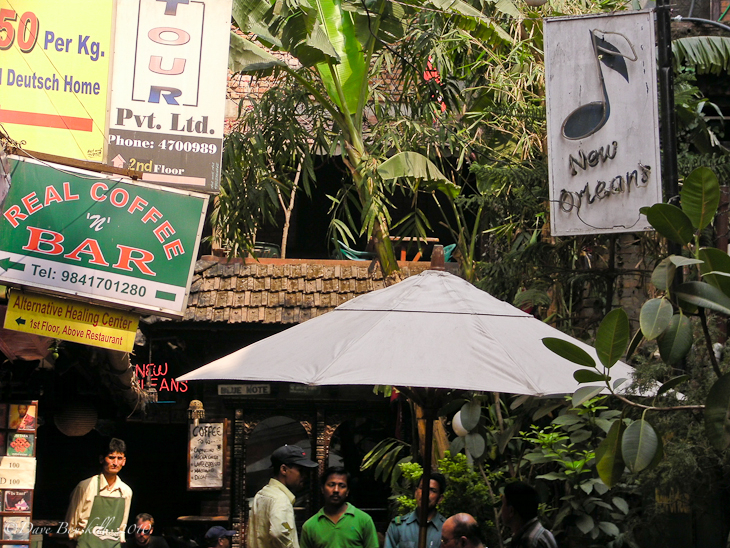 Located almost directly opposite of the Kathmandu Guest House, New Orleans 0ffers a wide variety of food. We enjoyed the Jambalaya and an ice cold beer in a chilled glass! Don't forget to try their apple pie. They have fresh baked goods on display at the cash. For a celebratory night after returning from your climb,or for a romantic meal with your spouse, La Dolce Vita was so nice, we ate there twice! The gnocchi and cannelloni were tops for us and we even splurged on a fine bottle of wine. Dine in peace and quiet in this second story eatery with linen table cloths and fresh brea, then retire to a comfortable sofa by the window to enjoy your espresso. This Italian eatery was the closest that we found to authentic Italian cuisine. Everyone in your party feel like eating something different this evening? If you can't agree on the type of food you all want, try the food court. This place is smartly decorated with sofas and padded chairs surrounding large coffee tables. If that's not your style, you can eat at tables too. With a selection of India, Italian, Chinese and Lebonese food, you will be sure to find something to please everybody's pallet. There are even balconies for outdoor eating and the wait staff takes care of your every need. This food court serves alcohol and provides free wifi. The bonus is after your meal, head over to the Espresso Bar in a separate section for a cappuccino and desert. In a hurry and not looking to spend a lot of money on your meal? 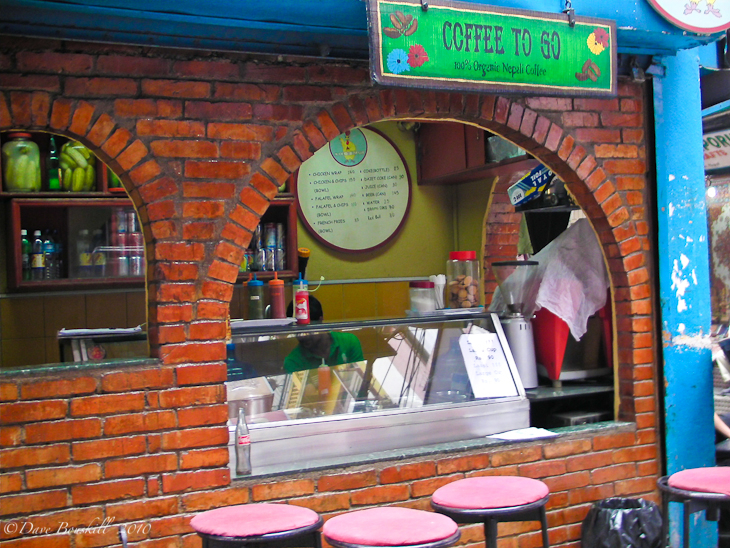 Coffee to Go's corner café has the best wraps and falafels in town. The vegetarian or chicken wraps are giant and filling. Located right in the heart of Tamel on the main street leading from Thamel Chowk to the Kathmandu Guest House, you can't miss Coffee to Go because there will always be a crowd of people feasting on its delicious wraps. The coffee is fresh and delicious and it is one of the most reasonable places to eat in the Thamel area of Kathmandu. Note: OR2K is located right beside Coffee to Go. 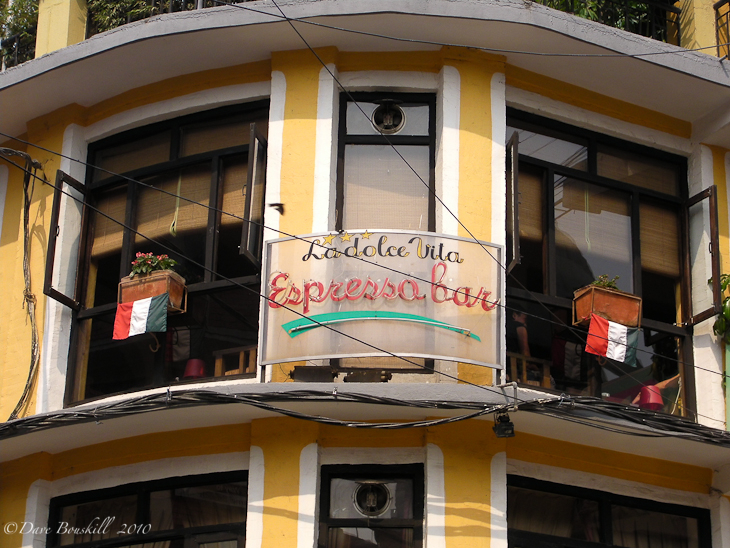 We noticed this cafe when shopping at the Sherpa Store on Tredevi Marg, west of Thamel Chowk. 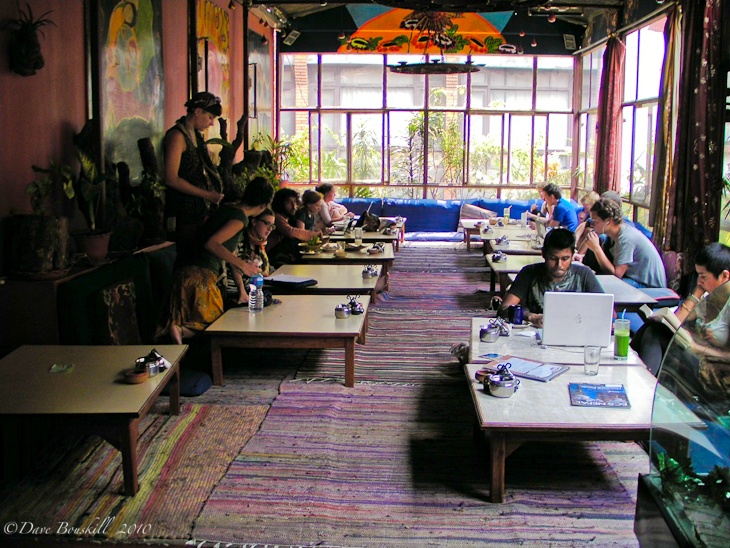 As we shopped for trekking clothes on the second floor, we saw a wall of people working on their lap tops in a trendy looking café. We tried it the next day and enjoyed a delicious breakfast and cappuccino. The breakfast consisted of two eggs, fresh fruit, toast and roasted vegetables. The presentation at this café is stylish and the service is prompt. It is an excellent place to hang out free from the heat, pollution and noise while enjoying healthy and tasty food. 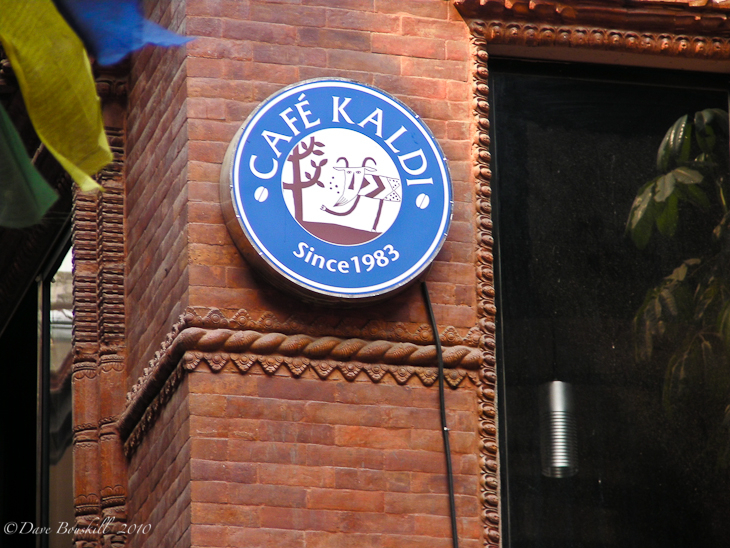 Cafe kaldi is located on the same side street as OR2K and Coffee to Go. Look for the outdoor shopping centre and cobblestone street. There is a Bikram (Hot) Yoga Centre located on the second story of the plaza. We sampled some other places to eat in Kathmandu. It was our home base before and after trekking to Everest Base Camp and Mountain Biking and Hiking in Pokhara after all, so we returned many times. K-Too Steak house is highly recommended in the Guide Books, but we were disappointed in eating there. Nameless Cafe – We found an excellent Mexican Restaurant that served wickedly fresh Mojito's just down the street from K-Too Steak House, but we can't remember the name. It is on the second story of the main street west of Thamel Chowk. The Chips and Salsa were outstanding. We Skipped the Nepalese Food in Kathmandu – I know many of you will be wondering where the traditional meals are. Why didn't we eat at any Nepalese Restaurants? Well, on the mountain you can eat all the Nepali Food that you want and if you go into any guest house in Kathmandu, you can order all the Nepal and Indian food you want. Our favourite guest house to eat at was Pilgrims Guest house north of Thamel Chowk. It had a wonderful quiet outdoor patio, free wifi and delicious eats. 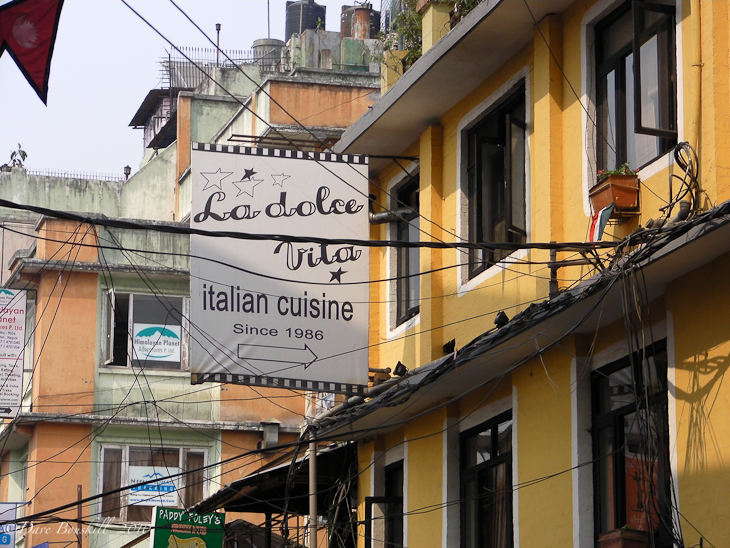 For us, when it came to choosing restaurants in Kathmandu, there was nothing we craved more than scarfing down some pasta and pizza after a long trek though the Everest Region. 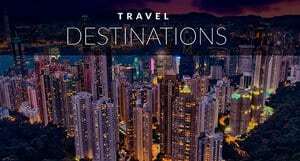 25 Responses to "Where to Eat in Kathmandu – Eight Great Spots to Indulge After Your Trek"
A perfect post for those travelers who are willing to travel to Nepal. Thanks a lot for this great post. Happy to do a google search for western food in KTM and find your post!! I am heading back there after 2 wks in Bhutan and for once really need a change!! Will be at least stopping by the Roadhouse tom’w! Might do OR2K another day too. best place to eat in nepal ? its got to be streets foods or some of the local food resturant, “bhatti”. can be argued by hygiene though. Street food is always awesome. We ate a lot of cheap street food there and knock on wood, never got sick. Thanks so much. The wife and I are off to Kathmandu in less than two weeks, and eating well is a priority with us! .-= Forrest´s last blog ..Back in Sharjah =-. There are a lot of great places to eat in Kathmandu, if you find some more (and I know you will:-), let us know. Have a great trip! OR2K is definitely a lot of people’s top choice. For 4 other restaurants locals recommend in Thamel, check out http://parakhi.com/blog/thameleats/. The blog also has information on news, events, and activities in Nepal posted by Nepalese themselves. Ok, I had to laugh a little bit at this, because I’m pretty sure the place you’r talking about is called….Mojitos! haha! Now that is funny. OK, there you go, the name is Mojitos!! Folks, Am writing this from Kathmandu and I am pretty sure the name of the restaurant with the good mojitos down the street from K-Too is called ‘Maya’. Thanks Greg! We had been wondering about the name of that place. Did you have a Mojito there? You hit on my favorites too! OR2K was such a treat on the weekends when I would come into Thamel from the monastery and want any food in the world that did not include rice and dal bhat! Though KTM at times can become a bit overbearing as a backpackers ghetto, it’s that way for a reason. Some of the creature comforts of home, particularly wonderful facsimiles of the comfort foods we know and love. Don’t get me wrong, I love Dal Bhat, really I do. However we spent nearly 3 years in South Asia, during that time in and out of Nepal 4 times I believe. Each arrival in KTM resulted in a frenzy of eating…great pizza, bagels, apple pie, some of the beat breakfasts in the world, hamburgers (or Yak burgers)…. I won’t even discuss the what the joys of eating in KTM can mean to somebody who has just returned from 3 months in W China/Tibet. As we were there more than a decade ago I’m sure many of the places have changed and nearly all the places you discuss are new to us. 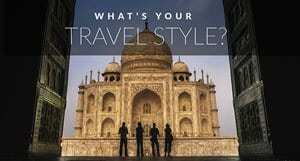 However, I’m sure arrival in KTM still excites every traveler who has been on the road for some time. .-= Trans-Americas Journey´s last blog ..Bye- Bye Belize – Quintana Roo- Mexico =-. Ooh! Loved this post, and have eaten at most of the places you wrote about. OR2K was probably my favorite of those mentioned. If you make it back to Kathmandu, check out The Third Eye, hands down the best Indian food I ate in Thamel. Great photos and explanations! .-= Alan´s last blog ..Cycling Africa with Mark Lawrence =-. Thanks Alan for the recommendation! Looks like there’s a nice mixture of food to eat in Kathmandu! I think I’ll head straight for that food bazaar and sample a variety of things! .-= Migration Mark´s last blog ..15 Ways To Have a Blast in Buenos Aires =-. 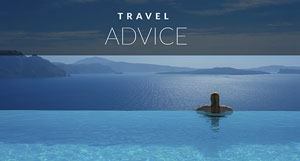 Great info – especially since I’ll soon be there! .-= Barbara Weibel´s last blog ..Giving in to Temptation in Merida =-. I was in Kathmandu a few months ago and LOVED the food! OR2K was amazing, we actually went there twice. We entered Nepal from China (Tibet) and I totally agree the variety of cuisine was well received. 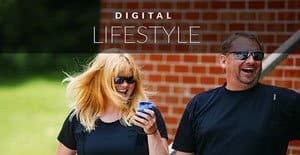 Great round up of restaurants, makes me want to go back to try your favorites. That is awesome. We didn’t find OR2K until the end of our time in Kathmandu. If we found it earlier, I am sure that we would have returned a couple of times. I wish that we made it to Tibet. oh well, next time we are in Nepal, we will make sure to take the trip over the border. And there I thought eating well in Kathmandu was an oxymoron – that’s the trekking part of the trip I guess.